Nintendo of Europe have released further details regarding the The Legend of Zelda: Four Swords Anniversary Edition, due to be released as a free download for Nintendo DSi, Nintendo DSi XL or your Nintendo 3DS. You’ll be able to re-live the classic multiplayer Zelda, previously released for Game Boy Advance, but this time featuring additional new areas and a single-player option to enjoy. For those looking to team up to play co-operatively, you’ll be able to enjoy the game with two to four players wirelessly on Nintendo DSi, Nintendo DSi XL or Nintendo 3DS as you set out to work together in saving Princess Zelda. However you won’t be totally alone, as an additional Link will appear beside you throughout your quest and it is even possible to independently control each by selecting either of them using the L or R Buttons. Players are also able to utilise a new “whistle” functionality in multiplayer via the X Button, that will allow you to call for attention and alert other players to your location on your map. Lastly there are two exclusive new areas to play that each contain three new levels, specifically created for this Anniversary Edition. 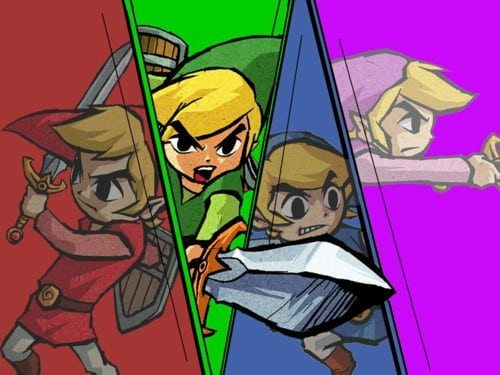 Through the completion of these new areas, each Link will be able unlock additional special skills with the ‘Hero’s Trial’ rewarding you with the Hurricane Spin, whereas ‘Realm of Memories’, made up of famous locations from selected titles in The Legend of Zelda series, will allow you to unlock the Master Sword. The Legend of Zelda: Four Swords Anniversary Edition is due to be available on September 28th, through Nintendo DSiWare.